We’ve just released an update to address the various minors issues you reported on Citrouille. We’re also working on a content update (free), but that one will not come until later. The Practice mode let you customize the challenge to your liking. You can set the number of lives you start with, slow the enemies down and disable friendly fire. The Adventure mode is the normal mode and the one that is recommended to new players. 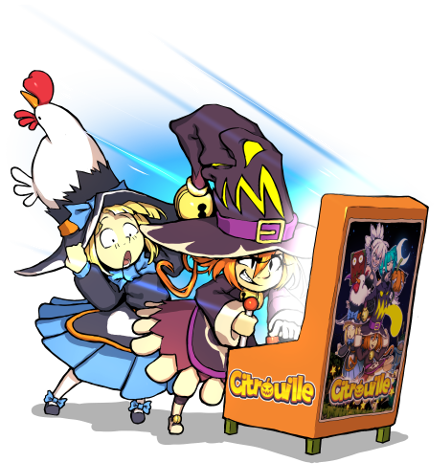 The Arcade mode is intended for speedrunners and those who want to beat the game without cheat or continue. New achievements have been added for beating the game in Arcade mode. We added some more sounds and polished the existing ones. All enemies attacks now have an audio feedback. We added translations for the two most requested languages: Brazilian Portuguese and Traditional Chinese. We made the boss a little bit more merciful, especially in Coop mode. We added a Retry button to the Pause menu. In Adventure and Practice difficulty, it makes you restart from the first level of the current world with your life counter full. In Arcade mode it makes you restart from the beginning.